Over the past year, several of my friends have said they thought it was always sunny in Italy—rain and storm clouds didn’t fit in with their image of Italy as an idyllic and picturesque paradise, as suggested in books like Under the Tuscan Sun. My husband likes to tell the story of a group of British tourists who golfed every day in the rain in the Tuscan countryside, and the one day they visited Florence, they didn’t bring umbrellas and were shocked by the rain. Their guide asked why they were surprised when it had rained all week, and they replied, “We didn’t think it rained in Florence.” That’s tourism for you; cloudy days captured on postcards or calendars wouldn’t sit well for prospective visitors. Well, it’s raining today. It kind of looks like a Portland morning, gray and a bit misty. On our way to run some errands, it started drizzling so we popped into Caffè Barrier off Corso XI Settembre (and no, the street is not named after the infamous 9/11, but for the 1860 liberation of Pesaro by Garibaldi’s troops which unified Italy). This is one of my favorite cafés . . . I’ll do a ratings system of cappuccinos around Pesaro in another post. We savored our coffee and read the local paper before heading back home, shielding Alex’s stroller with two umbrellas. What happened as soon as we stepped inside? It was sunny again. 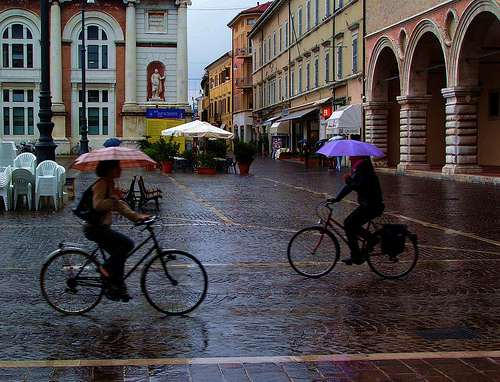 This entry was posted in cappuccinos, Italy, Uncategorized and tagged cafes, cappuccinos, Pesaro, rain, tourism, Tuscan, umbrellas. Bookmark the permalink. Love this picture!! I don’t care if it’s raining. It’s still unbelievably gorgeous!